Norman sees dead people. They’re all around him, souls of the dead with unfinished business or whom died a sad death. They speak to him, almost seem to confide in him, but he’s an outcast with a horror obsession that doesn’t see a purpose for his vision. Norman is bullied at school in the usual kids movie way. People write on his locker, they brush him aside, or push him to the floor. He’s a loner but a strong one, with a solid grounding despite his unique gifts. As it turns out, Norman is important. Every year, his creepy, bearded uncle has kept an angry witch at bay. Yes, the uncle talks to dead people too. This year, on the anniversary of the witches death, it’s going to fall onto Norman’s lap to subside the rage. With the witch come seven zombies, cursed to walk the Earth forever, but not for brains, blood, or victims. That’s ParaNorman’s sharpest twist. The film is about understanding and acceptance, yet told in an obvious way that doesn’t come across as preachy. Elements are sternly inserted into the narrative as zombies strut about losing limbs and battling scared locales. 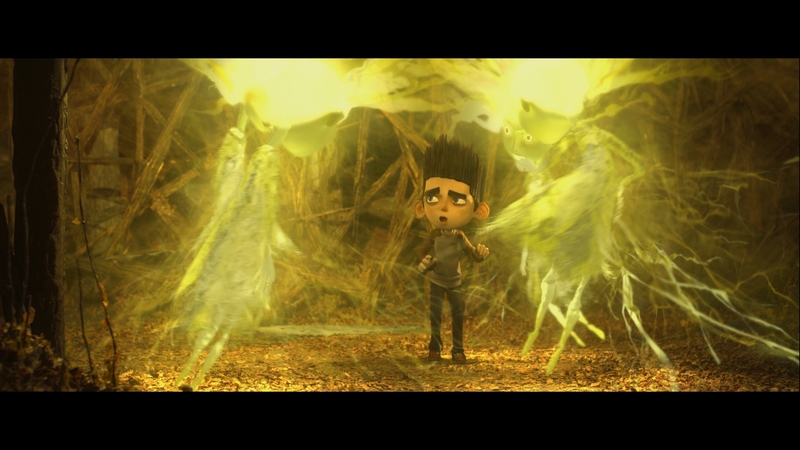 There’s more to it than merely being the oddball kid; ParaNorman concerns us all. In a year of Pixar and Disney animation dominance, the best of the animated lot ends up being this little chiller. It’s fantastic. ParaNorman is unexpectedly morbid and open with regards to death as much as it is Norman’s world. This is a downtrodden community and sloppy world. There are no perfect lines, shingles hang off to the sides, and doors barely sit in their frames. Even cell phones are rough and rundown. It’s reality viewed through a skewed filter. Norman’s quest is littered with small victories to propel him forward towards his lessons on life and acceptance. One moment he’s awkwardly making a friend, the next he’s protecting the bully that relentlessly made fun of him. It’s all a set-up to build Norman emotionally, to cast aside his awkwardness into something he can use to bond a town and save a lost spirit. His progression is total. ParaNorman is driven by side characters too, from the pokey teenage sister to the irritated father who doesn’t understand his son. Everybody grows here, and not in a forced, artificial way. Each has their arc to complete and learn from, which is wholly refreshing in an era where sidekicks are rarely more than comic relief. It’s easy to go on for days about the artistry in every frame. Trying to dissect some of the technical stop motion achievements is grounds for a headache. The patience and time investment – in addition to problem solving – is immeasurable. 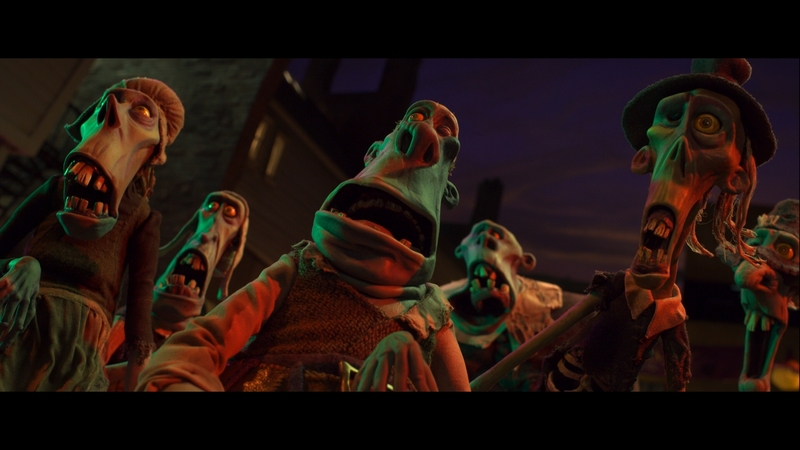 On a sheer creative scale, ParaNorman is probably the best looking film this year as well. This is a remarkable accomplishment. Universal spits out an AVC encode for this stop motion gem, pushing out a clear, precise digital source that makes the compression invisible. About the only thing ParaNorman does wrong are dark interiors; black levels don’t hold up to scrutiny and wash out slightly. That’s the only inconsistency you’ll find on this disc. Charming visuals are fed onto the screen with superb precision. Miniature grass, blowing leaves, flowing hair, and eccentric backdrops are awe-inspiring. The sharpness allows the viewer to pick up on signs, objects in the background, or other elements that stick out on repeat viewings. Norman’s world is a movie sightseers dream. 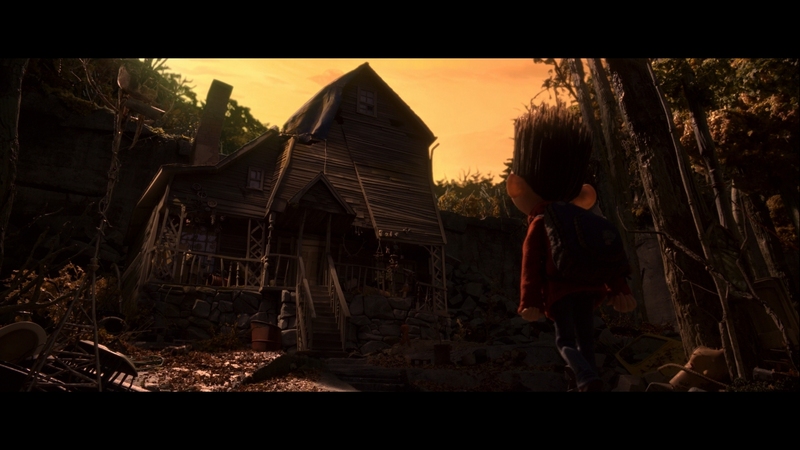 ParaNorman’s levels of saturation will shift to suit the needed emotion of the scene, from the flat, sickly greens of the zombies to a blazingly yellow finish. Sun will beam in on the characters or set over a cemetery, brightening the image with a contrast that sells the hues. It’s also a boon to the contrast which for the spookiness of ParaNorman, is often bland. To stop motion, Blu-ray has proven crucial. The level of resolution allows the full breadth of the designs to pour onto the screen, including perfectly knitted fabrics and texture on the puppet’s skin. It doesn’t miss anything, and with such a tremendously high res source, the material is made to look perfect. Thunder is ParaNorman’s aural achievement, booming into the subwoofer with superb weight and tightness. In the later portion of the movie, it’s effectiveness cannot be understated, always ensuring the audience is aware that something is brewing outside. Much of the film though relies on smaller scale effects, or specific placements. It’s always a pleasure to pick out a bike’s kickstand being presented in the right front to match the on-screen movement. Norman’s first chat with the ghosts in his neighborhood is a joy as voices spout up from every location. Dialogue will spread a little bit and also produce a limited echo inside some spacier buildings. This isn’t an immediately impressive audio mix, but despite being small, has some huge moments. It takes time to build itself up, and almost mirrors Norman’s own increasing bravery. As it grows, it becomes bolder in its aggression until the soundfield is filled with storming mobs of people, winds, and thunder… so much thunder. Co-directors Chris Butler and Sam Fell step onto the disc commentary duties, chatting over the movie and three animatics that last nine minutes. Peering Through the Veil is the stand out though, a generous look behind-the-scenes for 40-minutes that brings out the immense work involved in creating this piece. Seven featurettes total 15-minutes with a distinctly personal one leading the way. U-Control picture-in-picture carries these features over if you prefer that method. BD-Live and D-Box support are left.